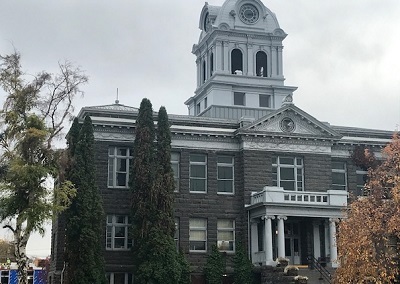 PRINEVILLE, OR -- The Crook County Court plans to send a letter to pro-Second Amendment groups across the country, calling for action and assistance. Judge Seth Crawford says he and County Commissioners are concerned about the potential impacts of several bills proposed, or expected to be proposed, in Salem this session, which he says could severely limit the rights of gun owners. Crawford says one piece of legislation would prohibit ownership of any firearm that carries more than five bullets. Senate Bill 501 would also limit rights to buy and store ammunition. Judge Crawford says they're now asking for reinforcements, "A letter that we plan to send, to ask them to come to the state of Oregon and help protect Crook County citizens' Second Amendment rights, as well as all the citizens in the state of Oregon." He tells KBND News, "First, I would like to have them work with the legislature, alongside us, to try and stop these laws from moving forward, but I think if they do pass, I would really hope they would come in and help us take these to the Oregon and then US supreme court to show that they're unconstitutional." The County Court approved the verbiage of the letter, this week. Read it in full, below. Crawford plans to also send it to government officials and every county's leadership. "I agree with both sides of the legislature that it's never good with gun violence is used to kill innocent people," says Crawford, "But I think, when you add laws like this, all you're doing is hurting the law-abiding citizens, and putting them in a precarious situation." He's also calling on gun owners to write to elected leaders and get involved in the fight. Crawford is also working with leaders in neighboring counties, and he says he's gotten positive feedback regarding the letter. Crawford believes unless Oregon residents band together, they could lose their rights. My name is Seth Crawford and I serve as the Crook County Judge. Jerry Brummer and Brian Barney are Commissioners and the three of us make up the elected body responsible for managing the County government. While we are a traditional rural county, we are also home to multiple large data centers. Many of our residents’ livelihoods require access to firearms. Caring for their livestock and crops, feeding their families, and protecting themselves and their families are just some of the reasons that firearms are important to our residents. We agree with legislators of both parties that innocent people being killed or injured by gun violence is unacceptable. However, legislation being proposed will likely have unintended consequences for the County’s residents and their way of life. Many of our ranchers have gun racks in their trucks, just like other tools. To hold them liable if someone steals a gun out of their truck and uses it to commit a crime will have a devastating impact on their ranches and families. There are many differences between the needs of urban and rural areas, and these proposed laws are written from the urban point of view. In this region of Oregon, firearms are not a luxury. For the people of Crook County they are considered a necessity. We are aware of multiple examples of legislation being proposed this legislative session that could have grave impacts on gun owner's rights. While we believe that these laws infringe on our citizens’ constitutional rights, we do not have the authority to decide if these laws are constitutional, or the expertise to make that judgment. That power rests in the hands of the Oregon and U.S. Supreme Courts. As the highest elected officials in Crook County, it is critically important to safeguard our citizens’ constitutional rights. As a rural county, with a small population and many pressing issues, finding adequate resources is a constant challenge. California and Washington have recently enacted sweeping laws regulating firearms, and we fear that similar laws in Oregon could jeopardize our citizens’ constitutional rights and way of life. Many rural counties in Oregon with similar concerns, and have reached out to us for support. We are willing to help lead on these issues, but we need the outside legal and advocacy expertise that your organization offers. Urban legislators have not taken the time to understand the need/use of firearms on rural ranches and farms. Crook County and the state of Oregon need your help. We seek your advice and resources to help us educate our community and the legislature regarding this important issue. Please let us know if we can count on your help?